It is important to note that this study sample represents a relatively small, albeit important, subset of the total home health and home care/personal care workforce. The sampling frame included only workers employed by Medicare-certified and/or Medicaid-certified agencies or agencies licensed by the state. Workers employed by unlicensed agencies were not included, nor were independent providers hired directly by consumers or their families. Workers who did not provide ADLs (e.g., those only providing homemaker chore or companion services) were excluded from the sample. Finally, 41,220 weighted cases had to be excluded from the analysis due to missing or anomalous data, and these cases differ significantly in some respects from the 119,500 cases included. These selection criteria are likely to explain, in large part, the differences between the relatively small, weighted estimate of the size of the home health worker population reported in this study compared with other published estimates derived from the Bureau of Labor Statistics (BLS) data (BLS, 2012). The BLS used a much broader definition of both agency and worker (including self-employed individuals and those providing only homemaker chore and other instrumental ADLs). 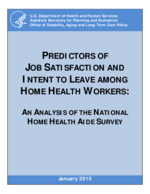 This study is also limited to a cross-section of currently employed agency-based home health workers, limiting the research team’s ability to examine the characteristics of individuals who have left the job or the sector and to calculate turnover rates at the worker-level. While this cross-sectional study sample does not represent the entire home care workforce, it focuses on a significant subset whose characteristics and outcomes are important to both Medicare and Medicaid policies. Another limitation is that models presented in this report are likely to have been affected by selection bias, as are many studies of employee satisfaction and turnover intentions. Workers who may have been dissatisfied or, for other reasons, had intentions to leave their jobs could have already terminated their employment prior to the time of the survey. It is unclear whether those who left their jobs in the time that the survey was administered differed in substantive ways (e.g., skill level, level of dissatisfaction) from workers represented in the NHHAS.